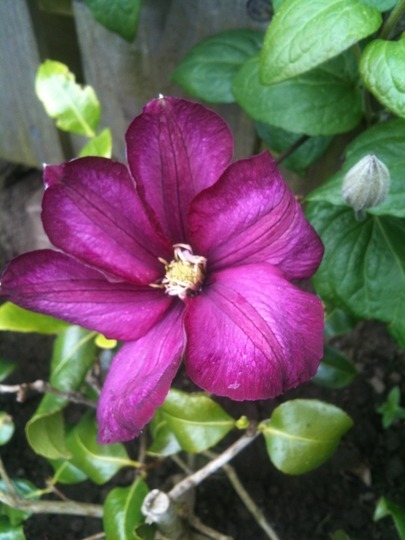 Can anyone put a name to this clematis? It has just began flowering this week, if that helps. I was going to suggest Niobe too, beautiful whatever it is! But Ville de Lyon starts flowering from now on, which is why Andrewr has suggested it I imagine. Yes bamboo I pruned it right back to above a couple of shoots for 2 reasons 1 i didn't train it up the trellis very well 2 it was right up the top of an 8 foot fence in a mass of tangles and the weight of it pulled it all over to the neighbour so they got to enjoy the flowers!!!! Have had a look on google images and can't notice a real difference in both these so I suppose it's the flowering time that will help identify. I will keep my eye on this bamboo, there are around another 5 buds just about to burst. Thanks for your help.